Without getting into details, let’s just say that I experienced more challenges in the first 18 years of my life than I did in the 14 that followed. Ouch! I’m not even sure what they meant by that, but it it stung. When I see memes like this, I feel that sting all over again. 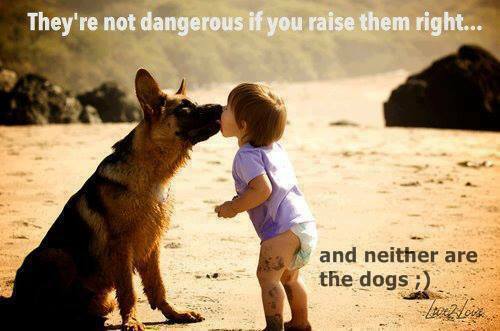 Speaking of danger, letting toddlers kiss dogs on the mouth is usually not a great idea. But I digress. “Raise them right”…..what does that even mean? Who defines what’s “right?” Is there only one correct answer? If one thing in your upbringing goes “wrong,” are you tainted? Is it a pass/fail test? What is this really saying about the kids who “fail” this test ? Are they all inherently “dangerous?” How so? Do they all behave uniformly? Is there some turning point where kids who “weren’t raised right” suddenly transform into monsters? How about the kids who were “raised right” — are they guaranteed to be perfect, all the time? Do we need not worry about them, by virtue of their upbringing? And if all of this is true, should kids who weren’t “raised right” be allowed in society? What should we do with these kids, in order to protect the rest of community from their inherent danger? Am I one of these kids? Eek! Turns out, even if a universal definition of being “raised right” existed, our outcomes as human beings are anything but straightforward. It’s a complex web of nature and nurture, personal growth, resiliency, resources, and individuality. What Messages Are We Sending about Shelter Dogs? 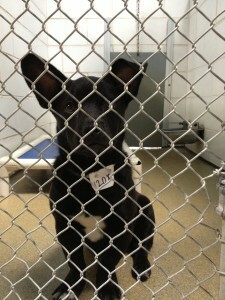 When we say that dogs who “weren’t raised right” will be dangerous, what are we telling the public about shelter dogs? While puppyhood is an important part of socializing and training a dog, it’s not everything. Dogs are complex beings, influenced by both nature and nurture, and many exhibit remarkable resiliency. Each one is an individual and will be affected by the past in his/her own way. Shelter dogs need our help changing public perception. We can start by sharing accurate information. Many shelter dogs come in as strays and we have no information about their previous lives. If “it’s all how you raise them,” then aren’t we saying it’s too risky to adopt out strays, because there’s a chance they weren’t “raised right” and could therefore be dangerous? Others come in through cruelty cases, having been abused or neglected. Are we saying that all victims of cruelty must always be killed, in order to keep the public safe? While the intentions behind these memes are good, the public is hearing a very different message: that shelter dogs, especially adult dogs, are not ideal candidates for family pets. In fact, in 2012 PetSmart Charities did a survey of people who acquired a dog in the past 12 months. Only 19% of respondents acquired their dog from a shelter or adoption organization. What Messages Are We Sending about Dog Safety in General? This message is not accurate; reality is far more complex. What what about dog owners who do everything “right” (however defined), and their dogs still show inappropriate or potentially dangerous behaviors. People go to great lengths to support their dogs, but sometimes there’s nothing we can do. Are we saying those people are failures? 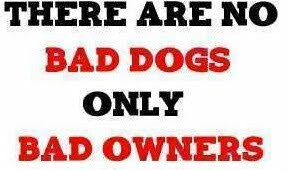 Are we saying they’re “bad” owners, even though they tried everything? Are we denying the possibility that some dogs just aren’t sound, no matter what support we give them? I know what it feels like to be on the receiving end of the comments and it hurts — especially when it comes from the animal welfare community. “Good” and “bad” are subjective, and these words distract us from understanding the full scope of the human-canine bond and understanding dog behaviors. Please, let’s put these inaccurate memes and slogans to rest. Dogs, humans, and our communities deserve better.